In the history of 20th-century nationalism, there is a distinct sub-group in which religion played a central organizing role from the start, providing so to speak the genetic code of the movement. The most significant cases are those which eventually founded stable parliamentary democracies. The three leading states of this type in the world today are Ireland, Israel and India. In all three, the nationalist party that came to power after independence – Fine Gael, Mapai, Congress – distanced itself from the confessional undertow of the struggle without ever being able to tackle its legacy head-on. In each case, as the ruling party gradually lost its luster, it was outflanked by a more extreme rival that had fewer inhibitions about appealing directly to the theological passions aroused by the original struggle: Fianna Fail, Likud, BJP. The success of these parties was due not just to the faltering of the first wave of office-holders, but to their ability to articulate openly what had always been latent in the national movement, but neither candidly acknowledged nor consistently repudiated. They could claim, with a certain justice, to be legitimate heirs of the original cause. Mr. Modi is widely expected to win when India’s eight hundred million voters head to the polls next month. He enjoys strong support among India’s “twice-born” upper castes that comprise the rising middle class; as well as among many lower castes (Other Backward Castes), a strata which he himself hails from; thus providing a broad enough base of political support to mount a credible campaign to form the next government. Mr. Modi has refrained from explicit ethno-religious mobilization; focusing instead on themes of fighting corruption and the promise of rapid economic development. Why? First of all, Mr. Modi doesn’t need to be explicitly communal. No one needs a reminder of his Hindu nationalist credentials. Hindu ascendancy is implicit in his candidacy itself. Secondly, despite his formidable caste coalition, he would still need the support of other parties to form the government; a support that would be less forthcoming if the BJP resorted to explicit ethno-religious mobilization. This essay will argue that Mr. Modi’s rise to the helm marks the coming of age of the Hindu state. For the confessional nature of the Indian state has been masked by the hegemonic ideology of the Indian Republic; in the sense that will be made precise shortly. Moreover, Mr. Modi may be authoritarian and a staunch Hindu nationalist, but he is not a fascist. What Indian Muslims realistically need to fear is not ethnic cleansing, but a further reinforcement of their second-class status. The nature of the Indian state allows the executive to bring India’s formidable apparatus of repression to bear against internal enemies in a highly-calibrated manner, and in a way that is region specific; checked, on the one hand, by the concentration of police power in the hands of state governments, and on the other, by the competitiveness of Indian politics. Furthermore, this essay with argue that the least threatening scenario is one where Mr. Modi is largely successful in delivering on his electoral promises; whereas, an unsuccessful, politically threatened, Modi government may prove to be a serious threat both to traditional scapegoats (Indian Muslims), as well as to the fabric of Indian democracy. ‘A staggering number of laws that sanction the use of coercive powers have been enacted in India,’ Arvind Verma writes. Noting that 53,000 people were arrested under the Terrorism and Disruptive Activities Act, of whom just 434 could be convicted seven years later, he underlines some daily realities of Indian democracy: ‘Torture is routinely practiced in most police stations and death in police custody is a frequent phenomenon,’ while – nominally outside the jails themselves – ‘the police practice of getting rid of suspects through staged encounters is unfortunately all too common. Suspects against whom the police are unable to bring substantial evidence or those who are perceived to be dangerous are simply murdered.’ Nor, while the police are at work, have the military been idle. In the 1960s, the army was deployed ‘in aid of the civil power’ some 476 times, and in 1979-80 alone, 64 times; often ‘openly stationed so as to provide a perpetual reminder, and on occasion an actual expression, of the fact that the existing social and political order in India is only to be challenged by its critics at their peril’. …unspoken realities of the Indian polity that emerged after partition, which take still more ominous form where it is contested. What the Armed Forces (Special Powers) Act [AFSPA] effectively does in such zones, the young Indian historian Ananya Vajpeyi has written, is ‘to create an entirely separate space within India, a sort of second and shadow nation, that functions as a military state rather than an electoral democracy, and only remains hidden because it is not, at least so far, officially ruled by a general or a dictator.’ This space should ‘not be thought of as a zone of exception, but as a contradiction so extreme that it undoes the totality in which it is embedded’, which breaks down into ‘two distinct and mutually opposed regimes’ that form ‘two nations: India and non-India’. In keeping separatist regions under its control by force, India is hardly special. All multiethnic states have troubled peripheries. But these internal borders, so to speak, tell us a great deal about the nature of the state under consideration. For instance, the Han supremacy inherent in the Chinese state becomes manifest in Xinjiang and Tibet where state terror is indispensable for the maintenance of Chinese rule. In 2006, the Sachar Commission report documented the pathetic socio-economic indicators of the Indian Muslim community. The blame for the downward mobility of Indian Muslims cannot be placed squarely on the policies of the state that emerged from the British Raj. The trajectory began much earlier. The deindustrialization of India during the nineteenth century disproportionately affected Indian Muslims; the land tenure system stratified the community, with a handful of Muslim and upper caste landlords benefiting at the price of destitution of the numerically vaster peasantry; the displacement of Urdu by English as the language of the court and administration robbed Indian Muslims of a major avenue of upward mobility; and, finally, the flight of middle class Muslims to Pakistan in 1947 left behind a decapitated community. The pivotal moment in the downward trajectory of Indian Muslims was the decision by Constituent Assembly to adopt an undiluted Westminster model – ‘first past the post’ – as opposed to proportional representation for the Indian Parliament; thus robbing Indian Muslims of any possibility of acting collectively to better their lot through representative institutions. If a Muslim party had possessed any proportionate share of national representation, its interests could never have been ignored in the coalition politics that have been the norm since Congress lost its monopoly of power. To add insult to injury, even where they were locally concentrated in sufficient numbers to make an electoral difference, these constituencies were not infrequently reserved for castes supposedly worse off than they, but actually better off. In mechanics such as these, Indian secularism is Hindu confessionalism by another name. Note that the adoption of ‘first past the post’ was designed not to exclude Muslims from power, but to secure a strong state. Specifically, the system was designed to deliver crushing majorities in the Lok Sabha for Congress, despite the fact that it never secured a majority of the vote. Gandhi had similar ‘mathematical considerations’ in mind when he fasted unto death to prevent Ambedkar from securing separate electorates for Untouchables. A ‘pact’ was reached to give a larger number of reserved seats to Untouchables elected, not by their own kind, but by Hindus at large – depriving the community of political autonomy by ensuring that Congress could pick its Uncle Toms for these places. The dreaded alliance of lower castes and Muslims was to obtain much later; once the Congress monopoly had been broken. A number of political coalitions emerged with such configurations in India’s many, highly-competitive, multi-polar states. Here too, the Muslim community’s developmental concerns had to be subordinated to concerns over security of life and limb; in what Sukumar Muralidharan calls “a crude protection racket,” whereby regional party bosses supply security in exchange for votes. In every election, the beleaguered minority is reduced to ‘voting tactically’ to whichever candidate stands the best chance of defeating the BJP candidate. So much for Muslim participation in India’s great machinery of representation. How do Indian Muslims fare in the apparatus of the state? All told, the ‘security agencies’ of the Indian Union, as the Sachar Report politely calls them, employ close to two million. How many Muslims do they contain? The answer is too sensitive to divulge: as the report notes, no data on their composition are available for three-quarters of these. Put simply, Muslims are not wanted in their ranks. In 1999, a former defense minister let slip that they numbered just 1 per cent of 1,100,000 regulars. In the Research and Analysis Wing (RAW) and Intelligence Bureau (IB) – the CIA and FBI of the Indian state – it is an ‘unwritten code’ that there should be not a single Muslim; so too in the National Security Guards and Special Protection Group, its Secret Service corps. The Indian armed forces are a Hindu preserve, garnished with Sikhs, and bolstered still – a unique arrangement in the postcolonial world – by Gurkhas from Nepal, as under the Raj. Mercenaries they may be, but their battle-cry could not be more impeccably Hindu: yells of ‘O Goddess Kali’ as they unsheath their kukri. ‘Myths have a way of running away with their proponents,’ G. Balachandran, an Indian critic of this outlook, of whom there have not been that many, has remarked: ‘Belief in the essentially secular character of the modern Indian state and society can often be little more than an exercise in self-congratulation which overlooks or rationalizes the sectarian religious outlook pervading large areas of contemporary social and political practice.’ The result is a blurring of ideological boundaries to a point where the BJP appropriates ‘the language of secularism’, Congress makes a ‘studied espousal of so-called soft Hindutva’ and the communist parties ‘proffer and publicize versions of a “purer” and “truer” Hinduism closer to popular religion as they understand it.’ In such a process of competitive de-secularization, as another analyst has termed it, the initial advantage could only lie with the BJP. Modi signals that the BJP intends to stick by its core ideological programme and will aim to wield power relatively untrammelled by allies of infirm conviction. This requires that he should establish the BJP in a position of numerical preponderance which would put its claims beyond question. A BJP with under 150 seats in a 543-seat Lok Sabha would be a party adrift, unable to win partners to its cause. Above that threshold but under about 180, it would be in an uneasy limbo, vulnerable to demands that leadership positions be awarded to individuals with a more congenial persona than the Gujarat chief minister. Beyond 180 – perhaps more decisively at 200 seats – the BJP would be assured of the victors’ laurels and would potentially be in a position of strength from which to conduct its bargain with potential allies. To reach this number, a strong performance in UP is absolutely essential. Clearly, the trend of tactical alliances between the Muslim electorate in UP and the other “plebeian” political formations has to be halted and reversed for a strong BJP performance. The Muslim electorate in UP has an 18% share in the total, but in absolute numbers, a large part of the community’s electoral influence is centered in two regions of the west. In the eight districts of the Upper Doaba and in the ten districts of the Rohilkhand region, Muslims account for 29% and 34% of the population, respectively. Every time the BJP has turned in a good performance in UP, it has managed to splinter the minority vote. This is the context of production of the Muzaffarnagar riots in 2013. A dual logic thus underpins Mr. Modi’s decision to stand for election from Varanasi. First, as the oldest and holiest city in the Indian imaginary, it provides a not-so-subtle ethno-religious signal. Second, it is a frontal attack to solve the UP dilemma. Mr. Modi’s machinations may or may nor succeed in securing a good show for the BJP in UP. But the overall realignment of the Indian polity is unmistakable. For the tiger that Mr. Modi is riding is not exactly Hindu nationalism. It is the chauvinism of India’s ascendant neo-Middle Class – the increasingly compact and economically resurgent social group of “twice-born” upper-caste Hindus – as the caste system itself witnesses a fusion at the top and two-tier stratification; with the system increasingly characterized by what has been called ‘upper caste racism.’ The turn to the market has not just empowered moneyed interests, it has also unleashed powerful aspirations among the neo-Middle Class. 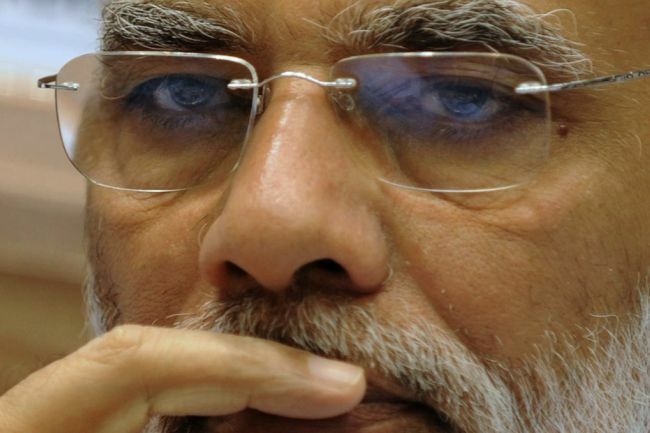 Given the numerical realities of electoral democracy, the Indian polity has until now been marked by – as Zoya Hasan puts it – ‘the frustration of the majority of citizens with governments they vote in but do not control, and the smug indifference of elites and middle classes towards governments they do not vote in, but control.’ In the candidacy of Mr. Modi, it is a break from this cycle that the neo-Middle Class can smell. Mr. Modi has modeled himself as Vikas Purush. Business and the neo-Middle Class – including the 2 million strong diaspora in the United States, Modi enthusiasts to a man – see in Mr. Modi someone who can root out corruption, push through market reforms, and deliver impressive growth rates. Therein lies the danger. To anyone familiar with the sheer scale of Indian corruption, it should be clear that even a strongman as ruthless as Mr. Modi stands little chance of actually accomplishing a fraction of what he has promised. Equally important, the fortunes of the Indian economy depend much more on the broader world economy than the policies followed by the Indian state. For instance, the present slowdown is driven largely by the monetary stance of the US Federal Reserve. The most effective method for elite-dominated ethnic parties to mobilize those target voters who are at risk of voting for the main rival parties will be to use ethnic wedge issues to increase—albeit in the short term—the salience of ethnic issues that will favor their party. One expects increasing ethno-religious mobilization to distract the populace. A second, related, danger is that in the event of more anti-Muslim pogroms, we will see a rise in the radicalization of Muslim youth, and home-growth Islamic terror. This will lead to further erosion of civil liberties; with more arbitrary arrests, torture and extra-judicial executions; which will feed back into more radicalization and further repression; a vicious cycle. While such a dynamic may restore the electoral fortunes of the BJP and Mr. Modi, it will take the Indian Republic in the opposite direction of developed status and great powerhood: towards barbarism and instability. This is not the first time a great nation has fallen for the charms of a strongman. Let’s hope for the sake of the traditional scapegoats – and the ‘bridgehead of effervescent liberty on the Asian continent’ – that this gamble by the neo-Middle Class pays off.